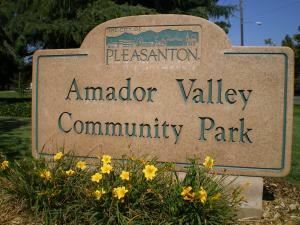 Amador Valley Community Park is a 23.5 acre park near downtown Pleasanton. The park amenities include picnic/barbeque facilities, two play areas, soccer fields and horseshoe pit. The venue's big attraction is the aquatic facility with four pools, a 50 meter pool, 25 yard pool, diving pool and shallow pool with a water slide. There is a great path around the perimeter of the park that is good for bike riding. Group picnic areas at Amador Valley Community Park can accommodate up to 200 guests and indoor facilities are also available.